I'm a sucker for a great environmental documentary. If a film can educate and inspire people enough for them to want to make a change in their lifestyles and feel like they are having some sort of bigger impact, then that is amazing to me. It demonstrates the power of film, especially documentary film, and proves how moving and personal a piece of film can become to someone. 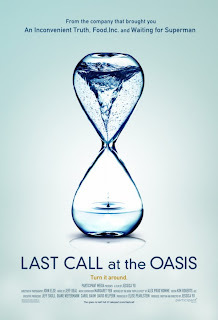 LAST CALL AT THE OASIS explores and educates the audience on the global scale of the water crisis that is plaguing us as a planet, not only as a country. It uses less than typical practices of an environmental documentary to try to get the audience to side with the film's perspective. 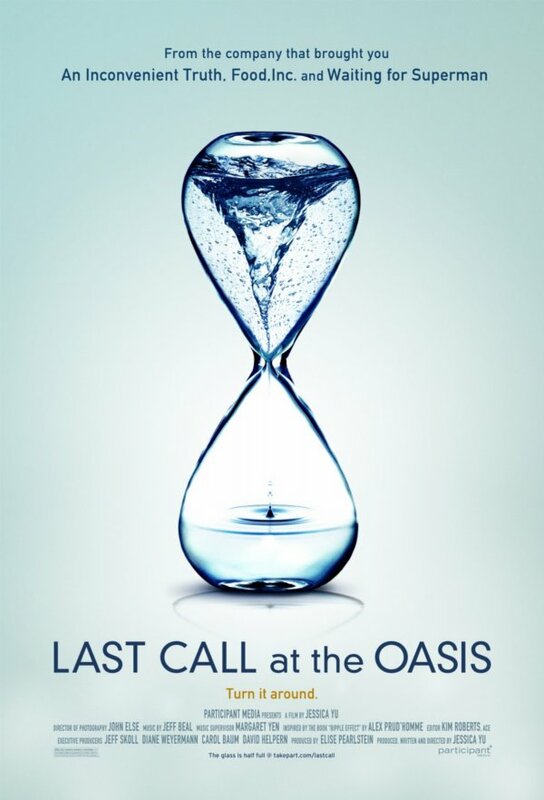 LAST CALL AT THE OASIS educates and informs the audience of the global water crisis that is not only happening in the US, but in the entire world. It's definitely marketed towards American audiences, in that it flat out tells us that we're the idiots who are making the problem worse, not trying to fix it. The film uses different tactics to try to get Americans to realize the impact and severity of the issue. The film follows several different perspectives of the water crisis to demonstrate to the audience exactly who this is impacting. One of the film's main stories follows Erin Brokovich in her eternal project to help small towns find their voice in speaking out against the government when it comes to the state of their town's water, and the effect it has on the local citizens. The most effective story for me was when the film shows the state that Australia is in right now. It follows a farming counselor of sorts, while he goes around to some farms he checks up on, and sees how it is affecting their families and lives, all because of how severely short of water they are. The man reveals that since the severity of the crisis there, there has been a sharp increase in the amount of farmers committing suicide, because without water, they cannot do what they do to support their families. The state of the water crisis in Australia is where America is going to be in less than 10 years, the film says, and seeing the families and farmers in this barren wasteland is seemingly used to scare the audience into believing this could be us soon. Even though LAST CALL AT THE OASIS is a documentary, it was shot very cinematically, and the opening title sequence is one of the most beautiful sequences I've seen. When the documentary switches from location to location it has an amazing vast, wide shot of the location with a really cool title card with the location on it. Even though it seems like such a small detail, it really added to the film. Since the film is all about the state of the water crisis and effect its having on....everything, it was great to see such a wide shot of the landscape it is effecting before each segment. This film is not dumbed down, at all. It is number after number after statistic after statistic from everyone from scientists to marketers. The whole issue is presented in such a vast way, it's hard to process it all afterwards and it gets to be very overwhelming. One thing I wanted from the film was an answer to what individually I could do to help, and it doesn't overtly tell the audience. I left wanting to make a change and be inspired, but I felt aimless. I think that may be the point because the whole issue is so grand and past an individual level, and as one scientist in the film said, "we're screwed". It's up to us to find out more and bring more attention to the issue on any level we can. There's not one specific answer to the crisis, and the film is more about informing the audience of the facts and coaching the audience on getting their voice heard on this issue, than about presenting a solid solution to the problem, because at this point, there's not one solution.